A delicate and intricate jewelry tree holder, this beautiful design with gorgeously embellish your environment while storing your jewelry as well! The product has been manufactured out of superior and resistant metal and then furnished with a layer of premium bronze paint, therefore it is a lovely rich brown color. 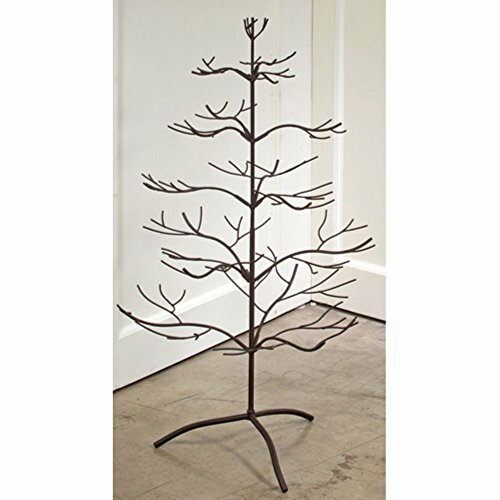 It contains a three-leg support for further stability, a tall and long body and a beautiful crown of interestingly intricate branches of various models for a wider range of storage. Therefore, you will be able to hang all of your items of jewelry on the branches of this lovely jewelry tree as it is rather big and spacious as well. you can easily hang your rings, pairs of earrings, brooches, bracelets and necklaces. It is great as a Christmas decoration as well since it resembles a Christmas tree so very clearly! It requires no complicate and time and nerve consuming assembly. This product is perfect for anyone looking for Christmas ornaments or other interesting ways of storing and also displaying their collection of jewelry at the same time! This tree will save up a lot of space around the house and it will beautifully decorate it as well with your own items of jewelry or any other trinkets! Get this astonishing tree at once and you will see it is definitely worth its money! The dimensions of the product are the following: 20 3/4″ x 19 3/4″ x 36″ (W x D x H) and its weight is 5.8 pounds.